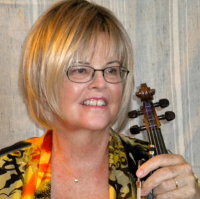 Ann Dunn is a concert violinist. She has been teaching violin to all levels of students, both children and adults, for over twenty years. Classes include solo performance, duets, and preparing for playing in orchestra. Technique and theory are taught from the beginning, and reading music as as soon as possible. Good technique is essential in learning to play. Before students can put feeling into their music, they have to be able to play in time and in tune. However, technique is learned not just through exercises but also through learning delightful and satisfying songs. This, after all, is why a person wants to play the violin. $40 half hour. $55 three quarters hour. $80 one hour. Free introductory lesson. Call 310-689-6499 or email. Will come to your home in Santa Monica. I am always gratified when a student makes violin his or her life’s work, however strongly feel there are many reasons to study a musical instrument besides being a professional. The most important reason is entering the magical realm of music. Playing an instrument is different from anything else you do. It is a completely new way of looking at the world. I have many busy adult students who take lessons just for one reason: it is a beautiful escape. Benefits of learning violin include discipline, focus. mental activity, dexterity, fine motor coordination, and a greater love for music.